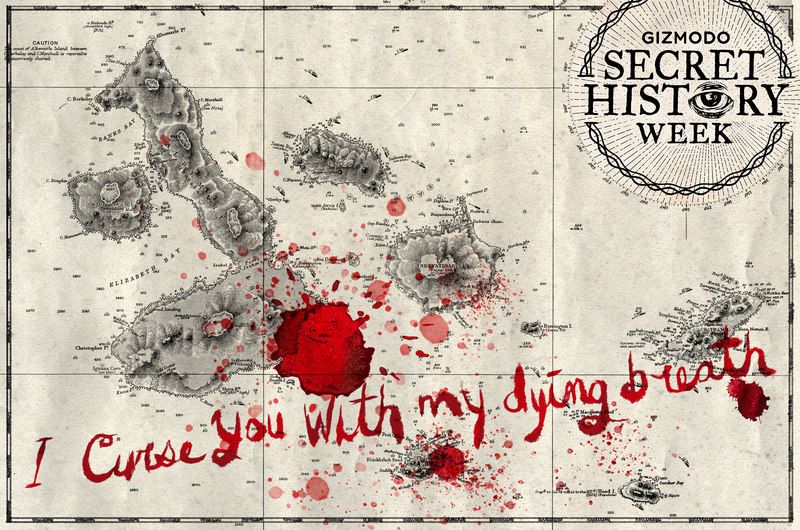 The Galapagos Islands are best known for their giant tortoises, but they’re also the site of one of the most bizarre homesteading misadventures ever, complete with proto-hippies, a polyamorous baroness, potentially poisoned boiled chicken, births in pirate caves, and unsolved deaths that look a lot like murder. Floreana, a small island in the Galapagos archipelago, currently has a population of around 100 people, including direct descendants of the island’s original German expat settlers. Charles Darwin popped by Floreana in 1835, and the small island’s desolate bay served as a makeshift post office for merchants and pirates before and after the HMS Beagle came to visit. Norwegian sailors built a house for shelter there and then abandoned it, and buccaneers hid out in the caves beyond the island’s spiky lava fields. However, it was the island’s first batch of wannabe permanent settlers who left Floreana with its most notorious legacy. In 1928, a German couple named Dr. Frederick Ritter and Dore Strauch showed up with a plan to create a utopia for two. Strauch wrote a memoir about her life on the island, and it’s like Into the Wild written by an old-timey German lady with Stockholm syndrome. She met Ritter, a doctor fifteen years her senior, when he treated her for multiple sclerosis. They bonded over their shared hatred of bourgeois domesticity. Ritter was a sort of reverse Henry Higgins for Strauch, pushing her to change from a bored city wife into a stateless, toothless hermit. He told her she could overcome her physical ailments through sheer willpower, she believed him, and they left their respective spouses and families to move from Germany to Floreana. He also held, uh, unorthodox views for a doctor. Ritter preemptively removed his teeth before the trip because he wanted to see if his gums would toughen up in the wilderness. He didn’t bother arranging for Strauch to get her teeth removed, nor did he bring any dentistry tools, so her teeth rotted and had to be yanked out with gardening supplies while they were on the island. Then they shared the one pair of DIY stainless steel false teeth Ritter had made. They also didn’t wear many clothes. Their only visitors were boats passing through Post Office Bay. Some of those boats contained people who told the press about the island’s often-naked settlers. They became minor celebrities from thousands of miles away when the papers published stories of the back-to-nature couple, characterizing them a modern-day Adam and Eve. Their newfound fame blew up their spot. Heinz and Margret Wittmer, another couple from Germany, read about the Ritters in the newspaper and decided that they, too, would shirk the modern world in favor of island life with their child, a preteen named Harry, in tow. Margret was pregnant, and they moved with the hope that Ritter would help her deliver their second baby and generally be their bud, not realizing that he was a deluded dickhead. The Ritters were not interested in being friends with the Wittmers. The Wittmers DIDN’T EVEN READ NIETZSCHE. “Frau Wittmer was a rather ordinary type of woman and a great gossip,” Strauch wrote. The Ritters refused to let the Wittmers homestead near them, so the Wittmers set up shop in a cave hideout formerly used by pirates. Magret Wittmer was equally dismissive of Strauch. “She began trying to prove her erudition, quoting Nietzsche and Lao-Tse. Oh dear!” Wittmer wrote in her own Galapagos memoir. Though the Wittmers were the more conventional pair—married, raising a family, eating meat, not fervent devotees of a homebrewed strain of existentialist prelapsarianism—they were largely successful at living off the land. The Ritters talked a big game about ditching society, but still relied on generous gifts from passing boats to build their Eden. The two small Floreana factions were on their way towards some kind of uneasy truce when another group of homesteaders arrived who couldn’t have been more different than the others. Eloise Bosquet de Wagner Wehrhorn called herself the Baroness, except when she called herself the Empress. The wealthy, platinum blond, dubiously royal Austrian arrived on Floreana with three men in tow: Alfred Rudolf Lorenz and Robert Phillipson, both her lovers, plus an Ecuadorian servant.She planned to build a luxury resort for rich yachters on Floreana, and generally horrified Ritter, Strauch, and the Wittmers with her focus on fame, riches, and amassing a corral of dudes to bone. The Baroness didn’t care about reconnecting with nature. She just want to jump on prime tourism real estate. Promptly upon her arrival she set herself up as the Empress of Floreana and, clad in a brassiere and shorts and with a pistol, she began her despotic rule. The Ritters and Wittmers were allowed to remain but all other intruders were rashly dealt with. Rumors tell of her shooting and even killing people, but these are questionable. A honeymoon couple cast adrift in a small boat from another isle landed on Floreana; the Baroness refused them aid and forced them out to sea again. She was also noted for shooting animals and then nursing them back to health. The Baroness acted as her own fabulist press secretary, and her made-up lies to journalists visiting the island infuriated the other settlers. Margret Wittmer described one of the headlines saying that Ritter had been “captured and put in chains” by the Baroness. The Baroness even convinced an expedition to make a short film, The Empress of Floreana—starring her. Aside from her clashes with the other expats, which continued to grow more agitated as she kept stealing stuff from them, the Baroness had domestic drama. Her younger paramour, Lorenz, started showing up at the others homesteaders’ shelters, complaining of how the Baroness treated him. Lorenz and Philippson got into at least one fistfight in front of the other settlers. And then the Baroness and Philippson vanished. The circumstances surrounding their disappearance are murky, and the surviving settlers told conflicting stories, pointing fingers at different people. Almost everyone was a suspect. In Strauch’s account, she heard a “long-drawn shriek” midday on the 19th of March, and figured she was being paranoid. Two days later, Lorenz showed up and said he’d patched things up with the Baroness. But then he came to visit Ritter and Strauch a few days after that with Margret Wittmer. They told a strange story: The Baroness and Philippson had been picked up by a millionaire’s yacht and had gone to the South Seas, and they were never coming back. The “Hacienda Paradiso” had been left untouched by its two supposedly-departing inhabitants, and the Baroness’ prized possession—a copy of The Picture of Dorian Gray—remained in the ramshackle hotel. Strauch didn’t buy it. She and Ritter had the best vantage point on the island, and would’ve noticed a yacht. “The Baroness had been murdered. Philippson had been murdered,” she wrote. Strauch noticed that the Baroness’ tablecloth was now on the Wittmers’ table. There was no ship anywhere near Floreana on the night the baroness is supposed to have left the island. During the night I heard shots and a woman’s scream. It could only have been the baroness. And the only person who could have fired the shots is Heinz Wittmer. The Wittmers, of course, strenuously denied this. And Margret used her memoir to turn the accusations around. A drought came to the island in 1933 and lasted more than a year, making it harder for all of the couples to find adequate food and water—especially Ritter and Strauch, since they were staunch vegetarians. They decided to start eating meat as the drought intensified. According to Strauch, they found dead chickens and decided to boil them and eat them. The diseased chicken made Ritter sick—so sick that the doctor died in agony, less than five months after the Baroness had absconded/been killed in such an unceremonious way. Just as Strauch had doubted Margret Wittmer’s story about the Baroness’ disappearance, Wittmer didn’t believe Strauch’s story about Ritter getting food poisoning. “Two people had eaten poisoned meat, and one was supposed to be dying, while the other had come all the way over to our house and still looked perfectly normal,” she wrote. Basically, both women used their memoirs to do everything up to outright accuse the other of murder. Meanwhile, Lorenz, now freed from his rival and mistress and/or possibly freaked out about murdering them, had already decided to get off Floreana as soon as he could. His eagerness to flee didn’t work in his favor. He convinced a passing sailor to leave immediately, even though the sea was rough, and they ended up marooned on Marchena, a tiny Galapagos island without a water source. Captain G. Allan Hancock, a frequent visitor to Floreana, found them months later, apparently dead from thirst. After Ritter died, Strauch left the island and returned to Germany. The Wittmers became the only remaining settlers. Harry died in a drowning accident a few years later, but the island’s first baby, Rolf, became a tourism pioneer in a way that would’ve made the Baroness proud—operating an upscale Galapagos yachting company. Nowadays, the Wittmer Lodge is Trip Advisor’s #1 rated guest house for Floreana. “Awesome location, but disappointing property,” a review reads.